The unusual mind of Daniel Tosh has earned him the admiration of his peers by winning over audiences with his unique brand of stand up comedy. Tosh was born in Germany, grew up a preacher’s kid in Florida, has two sisters and one brother, is a surfer, a decent student, has bad allergies, began his foray into stand up, is a University of Central Florida graduate, took to the road, lives in Los Angeles on the beach, and loves his dog. Tosh is currently one of the most requested headliners in the country. He has also quickly evolved into one of the most popular and successful college acts, having performed at more than 700 campuses in his career. Tosh's casual style and sharp material have proven to be greatly appreciated by his audiences, young and old, but mostly young. Tosh made his network debut on the Late Show with David Letterman and has returned to perform several times since. Tosh has also appeared multiple times on The Tonight Show with Jay Leno. His previous television credits include The Late Late Show with Craig Kilborn, Jimmy Kimmel Live!, Last Call with Carson Daly, VH1's Best Week Ever with Paul F. Tompkins, FX's The Test, MTV’s Punk'd, Comedy Central's Premium Blend, Friday Night Stand Up, and Live at Gotham. In 2002, he taped his first stand up Comedy Central Presents special at the Hudson Theatre in New York City. While still living in Florida, Tosh hosted his own popular late night television show, Tens. Tosh has performed at the most significant comedy festivals across the globe. In 1998, he appeared in the New Faces at the Montreal Just for Laughs Comedy Festival. After the great response generated, he was invited to return two years later in his own televised gala at the Theatre St. Denis. In addition, Tosh has also turned in triumphant festival performances in New Zealand and Kikenny, Ireland, one of Europe’s largest comedy festivals, as well as multiple trips to HBO’s The Comedy Festival in Aspen, Colorado. 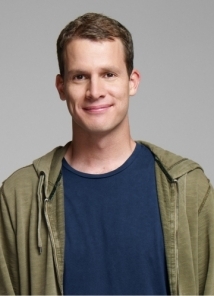 In 2005, Tosh was named one of Variety’s 10 Comics to Watch. When not performing comedy, Tosh surfs, gambles, and continues to pursue his interests in acting, hosting, and writing. Tosh's premiere CD, True Stories I Made Up, was released in November of 2005 through Comedy Central Records. His one hour special, Daniel Tosh: Completely Serious, premiered on Comedy Central in June 2007. Since then, he was featured in Mike Myers’ latest film, The Love Guru, he has hosted Live at Gotham for Comedy Central, and is enjoying himself touring theaters throughout the country. Tosh can currently be seen starring in Tosh.0, a series he created for Comedy Central.